While in the process of redecorating our family room, I wanted to add some pillows with personality. 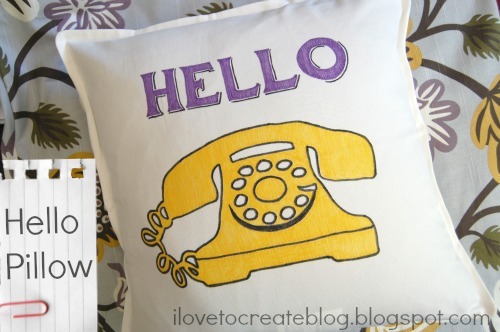 This "hello pillow" was super easy to make. I only needed a printer and my Tulip fabric markers. Here's how I did it. I found a telephone picture I liked from the internet and printed it out as large as I could. I also printed out the word "hello" in a font I liked. I purchased an inexpensive pillow cover at Ikea. I placed the papers I printed inside the pillow so that I could trace them. See how you can see through the fabric to the design? And here's a picture of the fabric I'll be using to bring the room together. I love a simple, easy project that's easy to personalize.